There are certain things you take for granted in America. The ability to mail a package at a post office is one of them. Marina bought a shower bench for her eldarly grandfather, who we unfortantely can't visit this trip and lives WAY out in Siberia. She bought the bench in America, and figured it would be much easier and less expensive for her to send it from within Russia than from across the ocean. Little did we know. 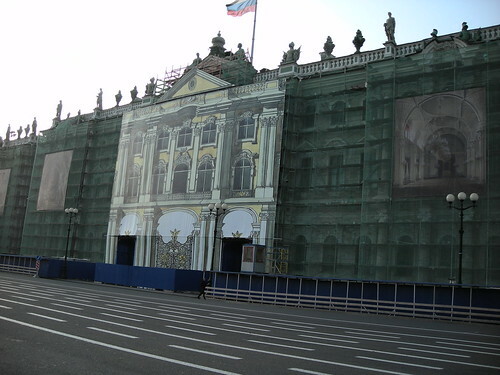 In St. Petersburg, when they are doing construction on a building, the put a picture over it of what the building is supposed to look like This preserves the look of the city, which is homogenous and planned to an insane degree. 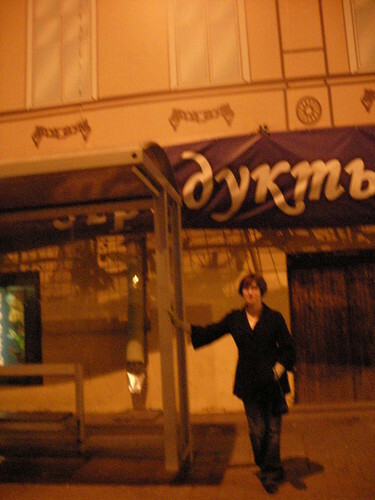 In the last shot above of Morskaya Ulitza, spot the building with a picture over it in the back (it's the one in the light). The entire city is basically in the general style of the buildings in that shot, with nary a skyscraper or instance of modern architecture in site. It gives the place a labyrinthine quality, especially at night, and Marina and I spent several hours wondering around lost very late last evening. 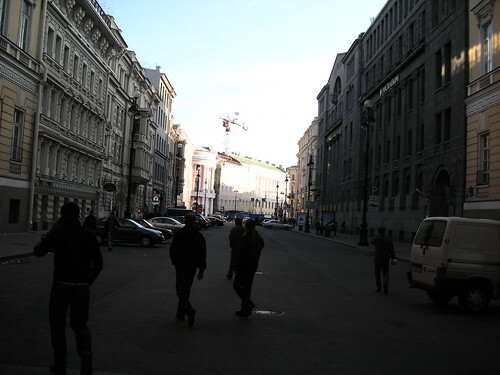 Edit: It should be said that the city's architectural style is beautiful and also somewhat haunting. It's just weird to have a whole city built in the same basic vein, kind of like the architectural equivalent to the Japanese national style of drawing comics. 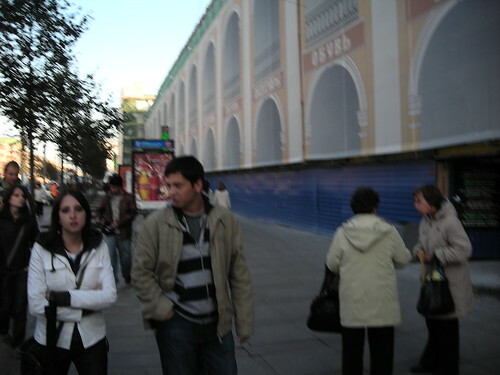 A woman who married a Russian told me once that if you're going to be with a Russian you have to learn their language, because Russians will think nothing of speaking only in Russian to each other, even if non-Russian speakers are with them. Even if all the Russian speakers speak English. Advice I should have heeded apparently. Got a twitter account on a lark. May or may not actually use it, but if any of you out there are twitterers (twitterii?) let me know. This is apparently a year old. Don't care. I've been terribly sick for a couple days, some kind of stomach bug that had me holed up in the bathroom. Today I can once again keep down solid foods, so that is progress. In other words, there's nothing here that I can't find in Coca Cola except for the Glycerin, which is there as a preservative anyway since alcohol isn't actually good for nausea, is it? But Emitrol is much more expensive than Coca Cola, and doesn't even have a nutritional box to tell me how many calories I'm consuming downing this sugar syrup "every 15 minutes" as prescribed. I mean what a load of crap this product is. And the only other thing my pharmacy had for nausea? "Cola syrup" which is literally the same stuff found in Coca Cola but without the carbonation. My mom used to give me coke when I was sick to my stomach as a kid. She's a doctor. I guess she knew what she was doing.